Father’s Day is right around the corner, let’s forget the neckties and wristwatches, and get the Dad in your life the tech he really wants. You might even find a little something for yourself along the way. Here are some of our personal favorites, got some of your own? Share those within the comments and we will give you a shout out on social media. BTW….we’ve got a surprise for you so make sure you check out the end of the article for a fun GIVEAWAY! Amazon Kindle – Yes, tablets and smartphones can double as e-book readers. But the $79 Amazon Kindle has a long-lasting battery and a paperlike screen that avid readers will appreciate. You can even set it up and download some of new books that dad would like to read over the summer. Wireless Keyboard – Dad loves his tablet but still isn’t keen on the touch screen? Get him a wireless keyboard that he can easily use with his tablet so dad feels like he is back on his laptop or PC again, but with a smaller screen. Bluetooth Speaker – There are many on the market but the JBL Flip is a great choice for under $100. It’s portable, rechargeable, has speakerphone capability, sounds great for its size, and works as a wireless speaker with virtually any smartphone or tablet. The perfect way to introduce Dad to the world of wireless audio and he then can jam out to some music while working out in the yard. Fitbit – Thinking dad needs a little motivation to stay fit? Get him a Fitbit which tracks every part of his day including activity, exercise, food, weight and sleep which will help dad stay motivated and for him to see how small steps make a huge impact. Universal Home Remote – Now this is cool! You can now control your TV and house with one simple remote and it’s easy enough for a 5 year old to use it so dad certainly can. The Logitech Harmony Home Control can control your living room TV and even shut off lights around the house using your smartphone. Streaming Device – Does your dad love to watch a little TV? With Roku dad can watch what he wants, when he wants. Roku 3 offers the largest variety of content, the most affordable and simplest to use. Phone Security Camera – The Piper Home Security Camera can be viewed through your phone whenever you desire. If dad wants to take off on a trip he doesn’t have to worry because the Piper Security Camera keeps everything safe. It’s a Z-Wave transmitter too, so you can even turn lights on and off and monitor when doors are opened and closed. Portable Jump Starter – No need to ask for assistance next time dad’s car doesn’t start. If he has the Powerall Element, Dad will be ready to jump-start his own or anyone else’s car within seconds. The Element is a very portable battery pack with enough juice to crank over a car’s engine, and also features an emergency LED flashlight. 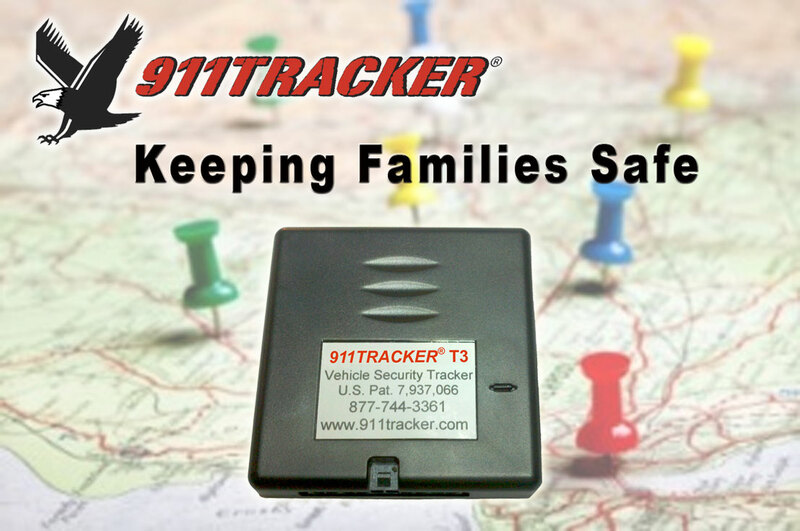 Anti-Theft GPS Device – Besides keeping dad’s vehicle safe from theft the 911Tracker T3 GPS Device can check the location of your vehicle and if someone else is driving the vehicle dad can check remotely how fast the car is going, direction of the car and even location. Perfect for dads with teenage drivers. 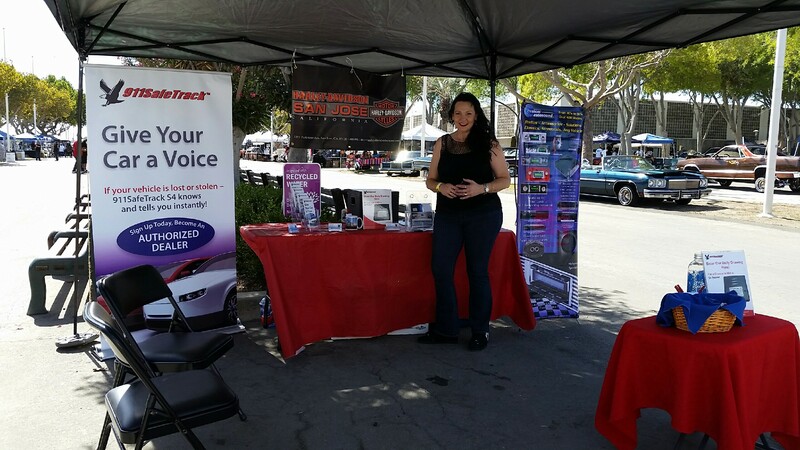 Bluetooth Speakerphone – We all know how important it is to drive without distraction and in most States driving while using a cellphone is illegal. If your dad doesn’t have built in bluetooth system the Jabra Freeway Bluetooth Speakerphone is the next best thing. The bluetooth speakerphone allows you to make calls hands free and also listen to music through pandora or music stored on your phone. Like this idea? Now you can WIN the Jabra Freeway Bluetooth Speakerphone for your dad or even yourself…we won’t tell. ENTER HERE! 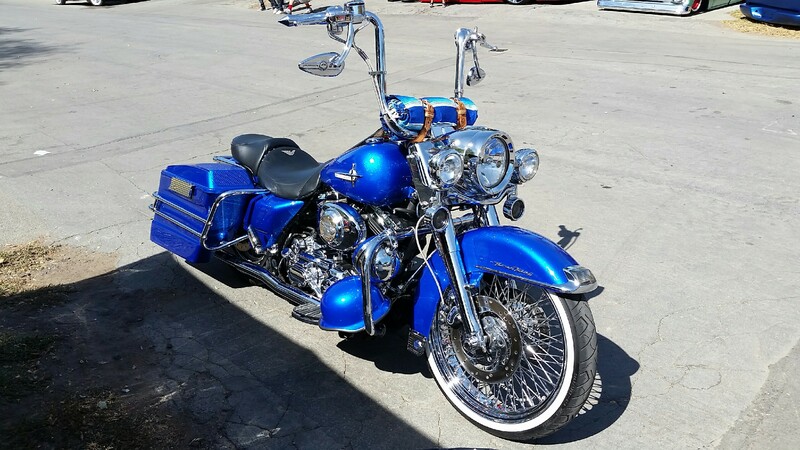 This entry was posted in Gift Ideas and tagged Gift Ideas, Giveaways on June 1, 2015 by Deanna. In honor of Father’s Day throughout the month of June we will be celebrating dads. 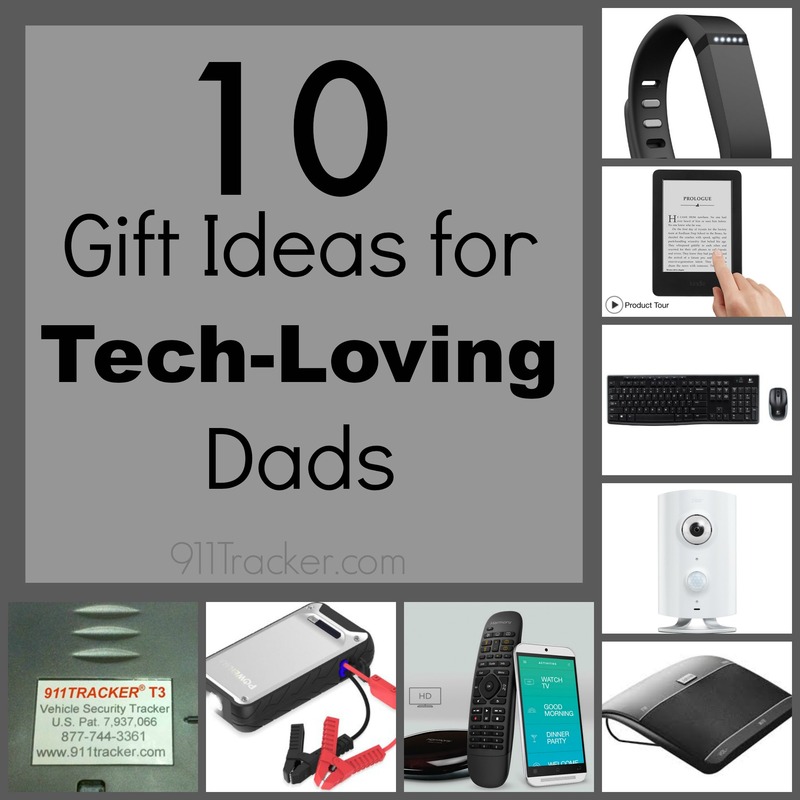 We know how much dads love fooling around with any sort of gadgets. We’ve compiled a list of our favorite 10 tech gadgets that any dad or tech lover would swoon over. One of our favorite tech gadgets is made for those car loves that may not have a bluetooth system built-in. The Jabra Freeway Bluetooth Speakerphone allows drivers to stay connected without even touching their phone. As we know in many states driving while using a cellphone is illegal which is smart so everyone on the road can stay safe while driving. The Jabra allows you to make calls hands free and also listen to music through pandora or music stored on your phone. Now you can win a Jabra Freeway Bluetooth Speakerphone for that tech-loving dad or even safe it for yourself. All you need to do is enter below….easy as that! Good Luck and Happy Father’s Day to all those cool dads out there! Giveaway starts June 1st and ends June 3oth. One random winner will be selected and emailed. 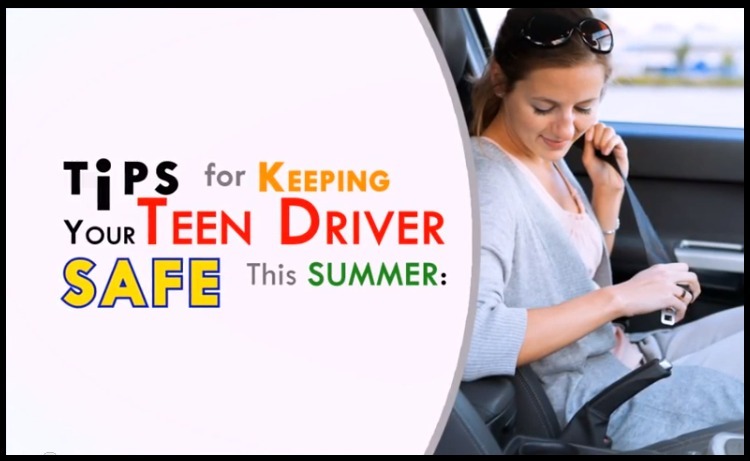 This entry was posted in Car Safety, Gift Ideas, Giveaways and tagged Car Accessories, Car Safety, Gift Ideas, Giveaways on June 1, 2015 by Deanna. Valentines Day is right around the corner and we are constantly looking for interesting gifts for that car lover in your life. In need of some clever ideas? Check out a few of our favorite creative gifts to be sure to rev up the romance. RACE TICKETS – Tickets to a major race will make for an unforgettable experience. Check out the NASCAR 2015 schedule. BRANDED CAR SHIRT – If the car fan you know is obsessed with a certain brand, why not get them a shirt from their favorite one? TRAVEL MUG – No one wants to spill coffee while driving. Give that car lover that travels often a perfect Travel Mug that will stay sealed and keep coffee hot. STERLING WHEEL KEY CHAIN – A car enthusiast can’t have their keys on any old key chain, they need something special. These key chains are one of a kind. If that doesn’t tickle your fancy check out all the other cleaver gifts AUTOart has to offer. GPS RECOVERY DEVICE – We spend thousands of dollars on the vehicles we drive, why wouldn’t we want to protect them just as we do our homes? Tracking devices are highly-effective in protecting against theft and hijacking, and for assisting in the recovery of your stolen vehicle. 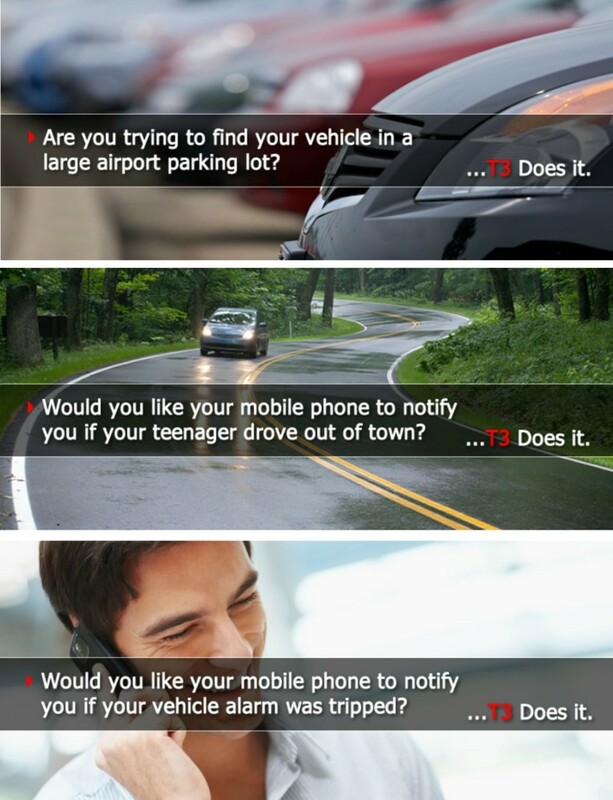 Learn more about the 911Tracker and how it’s making a difference in people’s everyday life. This entry was posted in Gift Ideas, Giveaways and tagged Gift Ideas, Giveaways on February 3, 2015 by Deanna. The holiday season is fast approaching, which means we need to get on the ball with purchasing all those gifts. At 911Tracker we want to get into the gift giving spirit by offering you a chance to win a T3 Recovery Device for yourself or someone you love. If you are impatient and can’t wait you can purchase one of two Recovery Devices with a savings of over $100. Wondering if you have anyone on your list that would benefit from a T3 Recovery Device? Got a child in college that has their own car? Do you worry about your elderly parents driving? 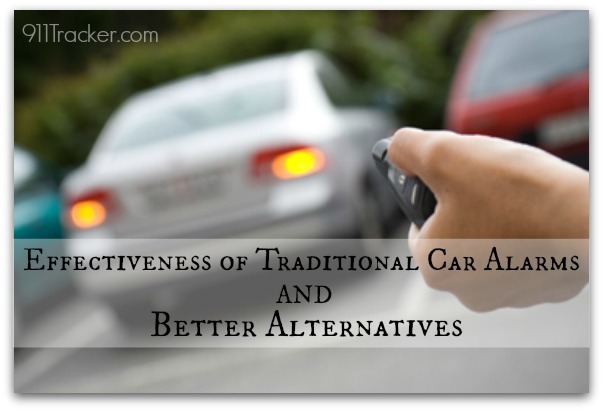 Does your spouse travel via car for work? Does your spouse travel via plane for work? Know of someone that lives in a area with high car theft rates? Got a loved one with a classic car or RV? The T3 isn’t your run of the mill security system, it does a much better job than the build in car security systems plus offers many other features. When purchasing a car tracking device like the 911Tracker, it benefits car owners by giving them peace of mind that their car is really secure. 1. 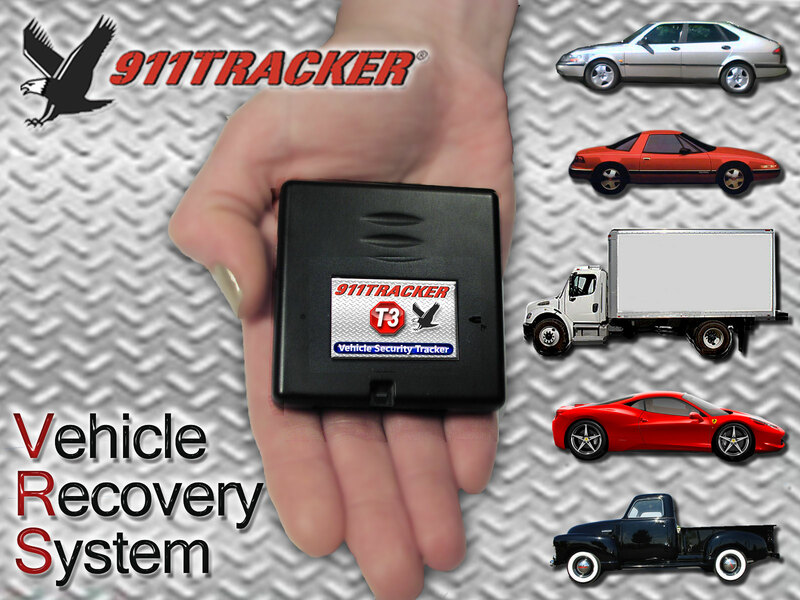 Gives you the location of your vehicle allowing you to recover it. 2. Saves you money because it lowers your car insurance. If you parked your car for a period of time you will receive notification if your vehicle is moved or if the ignition is turned on. 3. 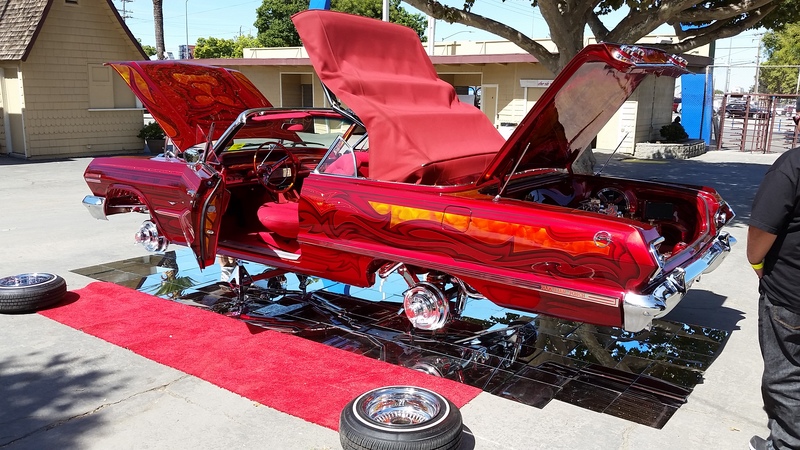 This is perfect for when parking the airport, auto body shop or valet. When 911 has been notified your tracker will give the current latitude/longitude, speed and where the vehicle is heading and is detected by E-911. 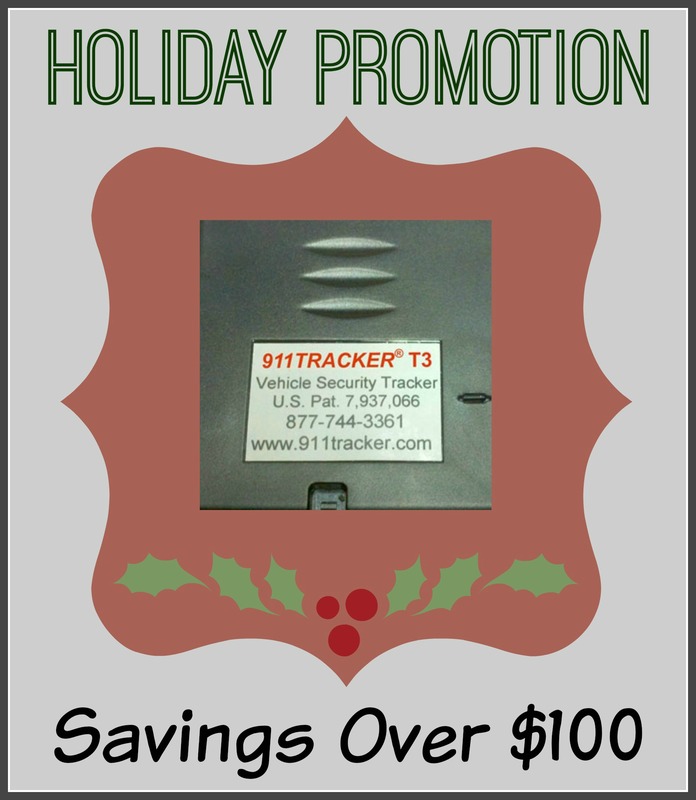 For a limited time we are offering a Holiday Promotion that will save you over $100. 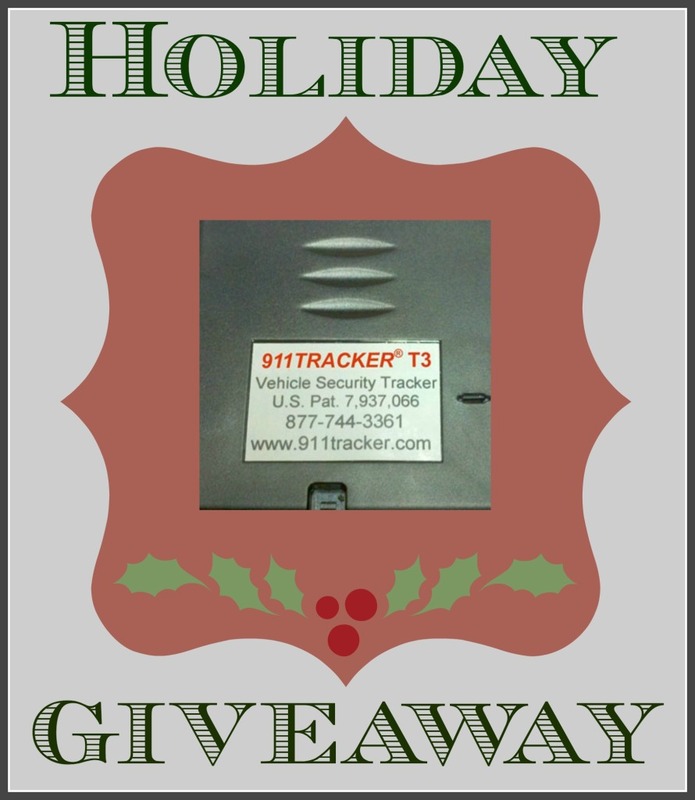 if you are feeling lucky enter in our T3 Recovery Device Giveaway. We will pick one winner within the United States on December 15, 2014. 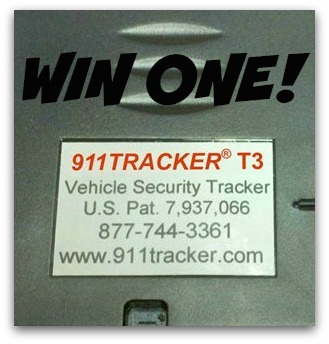 This entry was posted in Car Safety, Gift Ideas, Giveaways and tagged car security, Giveaways on November 17, 2014 by Deanna. 911Tracker now has —-> 911SafeTrack which features a special DEALER PROGRAM. 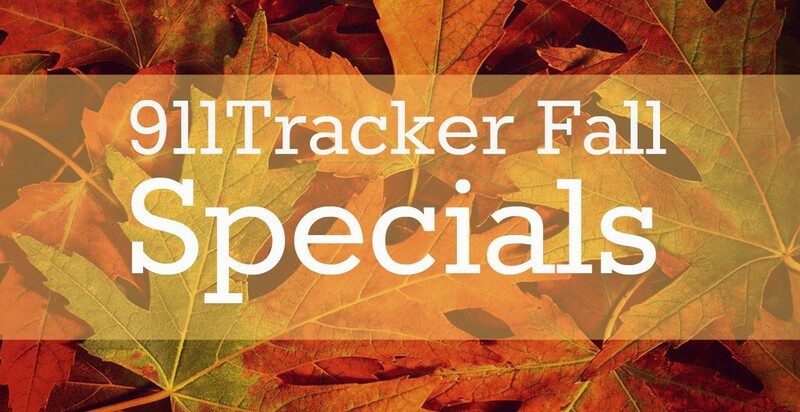 The S4 Tracker is now available to New and After-market Auto Dealers, Rental Car Agencies, Collector Car Builders, Auto Parts Dealers, and Stereo & Security System Dealers. Our mission continues to be a company that provides a rapid, affordable, and superior safety/security access to public safety by developing systems that will save lives and protect property worldwide. Permits the owner to check vehicle location, speed, and direction using a simple text message. If a theft is occurring, the S4 notifies the owner and lets the owner easily connect with the 911-Operator closest to the vehicle using the patented 3-way call to provide immediate information and real-time GPS location. LoJack® doesn’t do this. OnStar® doesn’t do this. The S4 lets the owner send a secure text to enable/disable the vehicle starter. The owner can assess the situation by viewing the vehicle speed, direction, and location on their smartphone using Google Map™. S4 can let the vehicle owner unlock the door in cases where the keys are locked in the vehicle. Communication with the vehicle is protected by a user selected 5-digit PIN thereby ensuring the vehicle owner’s privacy. No specialized police registration or police vehicle equipment is needed for the S4 to function properly. Car dealers can pre-load the S4 to protect against vehicle theft from the lot and can obtain insurance discounts. Dealers use the S4 as a selling advantage when closing the deal on a vehicle sale. Rental car agencies use the S4 to monitor when cars are checked in and out, can unlock the car if the renter left keys inside, and provide quicker response for roadside emergencies. The S4 lets the agency recover vehicles when they are not returned on time or to recover vehicles if a person using a stolen credit card rents the vehicle. When it is time to sell a vehicle, agencies use the S4 as a selling advantage. To help us celebrate being at the SEMA Show and the launch of our new S4 Recovery Device, we’ve come up with one heck of a giveaway! Enter to win an S4 Recovery Device. On November 15th we will draw 2 winners from the entries submitted. The giveaway will include an S4 Device plus a 3-month subscription plan worth over $300. 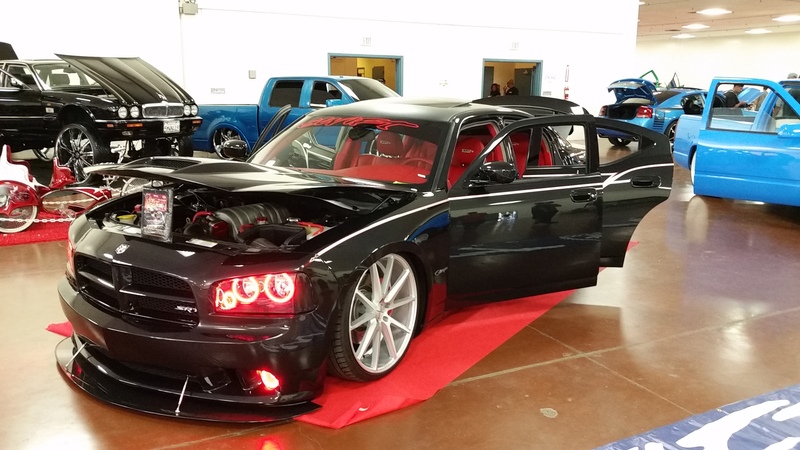 This entry was posted in Giveaways, Safe Driving and tagged Car Safety, Giveaways, Promotions on October 30, 2014 by Deanna.